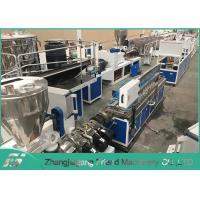 Home Companies Zhangjiagang Friend Machinery Co., Ltd.
PVC Profile Extrusion Line is mainly used for production of window/door and multi-hollow threading pipe etc. It consists of a parallel or conical twin screw extruder, a vacuum forming table, a tractor, a cutter and stacker. PVC trunking is one kind of PVC profiles. PVC Trunking is the ideal system for unobtrusive cable management designed to cope with the rigours of the factory and office. Specialized specification of parallel or conical twin screw extruder for related profile section needs. Optional extruder’s output range: 150kg/h-450kg/h. Tractor carries some our unique technologies such like the lift/down system. The pulling force is strong and very stable. The vacuum forming table is adopted large vortex cooling system for proper profile forming requirement. There are 4m, 6m, 8m and 11m length vacuum forming table for options. Manufactured to the highest standards of precision from high impact PVC in white finish and designed for rapid installation. Electrical stock trunking lengths and a full range of compatible accessories in standard section sizes. 3. Low energy consumption: our production line, compared with counterparts in China, can save up to 50% energy cost. 5. Long life time: Screws and machine barrels are made of high-quality materials and specially processed. The working life is up to 15,000 hours. 8. Famous international accessories: Siemens, Omron, ABB, etc. 9. Wide usage of raw materials: PP, PE, PVC, ABB, etc. Various wood powder and/or plant fiber. 10. Excellent mixing ratio: Up to 70 percent of wood powder could be added, under the control of some special formulas .